When issues with your oral health arise, it is crucial that you seek treatment immediately. During your exam, we need to see all parts of your mouth. However, there are many parts of your mouth that are hidden away from view. At Bradshaw Family Dental, we can get a complete picture of all structures in your mouth, which allows us to create a more effective treatment plan, with the CT 3D scan. What is a CT 3D Scan? A CT 3D scan is a type of scanning technology that is far more advanced than traditional CT scans and X-rays. The CT 3D scan uses a cone-shaped X-ray beam that rotates 360 degrees around your head to capture a 3D image of all structures of your mouth, including teeth, bone, soft tissues, and nerves. As the X-ray beam rotates around your head, it takes several pictures. Once the scan is complete, the technology pieces these pictures together to create a single 3D image. Specialized software allows us to manipulate the image in some different ways to see your mouth from different angles and investigate the smallest details. These features help to provide us with an accurate diagnosis and provide you with a much more effective treatment. What Can a CT 3D Scan Be Used For? • Assessing the anatomy of an infected tooth for an effective root canal treatment. • Determining optimal implant location. Also, with the ability to see nerves, we can avoid them. • Determining the need for a bone graft. • Evaluating sinus cavities and if you require a sinus lift before implant placement. • Evaluating tumors in the jaw. The process for getting a scan is quick and completely painless. Before the scan begins, you will be instructed to remove all jewelry and hair accessories with metal. Glasses and hearing aids will also need to be removed. When you are ready, you sit at the machine and place your chin on the rest. Adjustments to the CT 3D scan machine are made to ensure the best possible picture. The total time it takes to capture your image is less than a minute. However, you must remain completely still during this time. Once the scan is complete, it only takes a few more seconds for the image to show in 3D on the monitor. • Quick and painless. 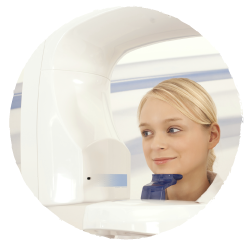 The scan takes less than 60 seconds, and you will not feel anything. • We are provided with high-quality images with much less distortion. • We can perform cross-sectional imaging. • Using specialized software, we can rotate your image to see your mouth from multiple angles. We can also zoom in on specific areas and enhance for greater detail. • With greater accuracy, we can provide you with more effective restorative treatments. • You are exposed to much less radiation than a traditional CT scan or full mouth X-ray sets. With a CT 3D scan, we can get a complete picture of all of the structures in your mouth, which then allows for a more accurate diagnosis and a much more effective treatment plan. Call Bradshaw Family Dental at (928) 277-0076 today for more information and find out how a CT 3D scan can help you.